Water Cutting is Clean and Safe – As the name suggests, water cutting does not generate any heat or fumes that could be potential hazards while working. No harmful waste products are created in the process, and the water used to cut the metal remains non-toxic. In addition, the method is environmentally-friendly as well. 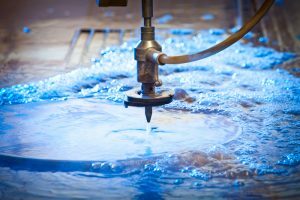 Water Cutting is Powerful but Sensitive – Water Cutting allows us to cut very thick slabs of metals with ease, and water jet cutting is effective for very hard metals. We can cut metals such as Carbon Steel, Stainless Steel, Hardened Tool Steel, Aluminum, Titanium, Copper, and Brass. 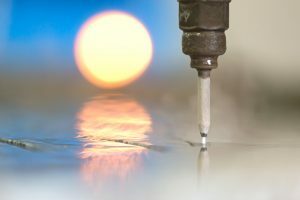 And unlike conventional laser or plasma cutting; the water does not damage the metal being worked on and does not cause any burring, scarring, burning, or cracking on the metal’s surface. In fact, water cutting does not change the target metal’s structure in any way, shape, or form. Water Cutting is Precise and Less Wasteful – Water Cutting technology allows us to cut complex and intricate shapes and designs out of metal. This is done in less time than it takes for traditional metalworking techniques to render a piece. Also, unlike in traditional metalworking; there is a smaller amount of material that is actually removed, which translates into savings for the client as there is less scrap metal generated. Here at Hydro Lazer, we have an experienced team of cutters who can create Architectural Metalwork to your design specifications. 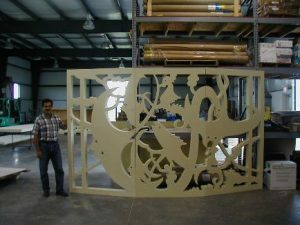 If you can design it, we can cut it! 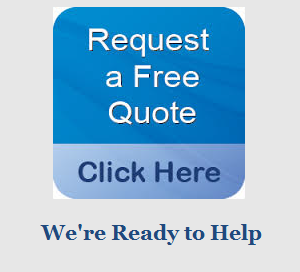 Contact us today, or request for a quote online. We are more than ready to fulfill all of your metal (and non-metal) cutting needs! Vital to almost all major industries in some shape or form, rubber and plastic are the flexible and dependable parts of many machines and devices. Hydro-Lazer is a market leader in cutting these materials in a variety of thicknesses and sizes to suit your needs. Rubber is a malleable material that can bend and even warp under extreme temperatures and plastic can do the same if not treated properly. Here are just a few reasons why choosing Hydro-Lazer to water-cut your materials makes excellent sense. Rubber products have common uses in almost every industry, including FDA-certified or compliant rubber gaskets for food manufacturing equipment. It’s vital for the material to maintain the proper shape without imposing any thermal stress that could warp and deform. Waterjet cutting rubber requires no abrasives and no heat, allowing for the rubber to be cut cleanly and with little waste. No burrs or cutting marks will be present afterward, leaving only a perfect line. Programmed cutting makes production time short, saving you both time and money. Better yet, relying on Hydro-Lazer for cutting rubber means your facility doesn’t need the added expense of equipment or hazardous fumes. Like rubber, plastic is a valuable material that is used in millions of different ways in almost every industry. 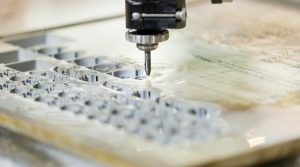 It’s critical that plastic is treated with care to prevent deformation during the cutting process, and waterjet cutting is the perfect process for this. With pre-programmed cutting patterns, waste is minimized and cuts are also made clean without burrs or marks. Rely on Hydro-Lazer for all your waterjet cutting needs. From tile and stone flooring inlays to cutting rubber, plastic, and steel, we can cut almost any material with ease. Contact us for more information today! One of the most interesting and exciting types of home décor available for hardwood floors is the visually stunning “floor medallion.” A floor medallion is a special decorative insert, usually round like a medallion, that can be customized to have almost any design and is placed in the floor to add to the aesthetic of a room. 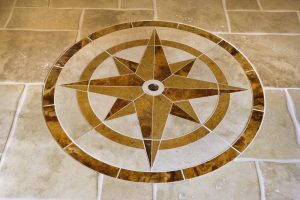 A popular form of floor medallion is a compass rose. At Hydro-Lazer, floor medallion inserts are one of our specialties. 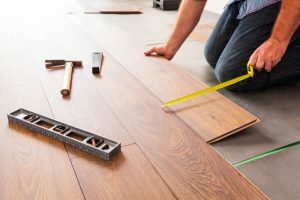 If you’re considering a floor medallion for your home, here are some tips for planning it out. It may be that you already have a design in mind, or you’re not sure what style you’re interested in. Whatever the case, there are some important considerations to have in mind before making a choice. It’s possible to get floor medallions in full color, however, these are harder to coordinate with an entire room. More commonly, designs are made with varnished or lacquered wood of different shades. These are easier to combine with the coloring of your floor itself and the style of the rest of the room. You’ll also have to be careful about how small or large your design is. Too small and your details may become obscured, but too large and it may be difficult to arrange your furniture or another décor around it. Another vital part of planning for a medallion is knowing where it will go. The very best way to plan out the location of your medallion is with a floor plan of your home. It’s also helpful to have a cardboard or paper cutout at the size of your desired medallion that you can place on the floor to see how it fits with your arrangement and how your furniture needs to be moved, if at all. The goal with a medallion should be to create a balanced visual space. Often times the easiest way to do this is centering the medallion in whatever space it’s added to, but that’s not the only way. The important thing is that the placement feels intentional. If a floor medallion is something you’re considering for your home, choose Hydro-Lazer to cut and install it for you! We guarantee it will look fantastic and last for years to come. Contact us today with your ideas, and we’ll get started right away. 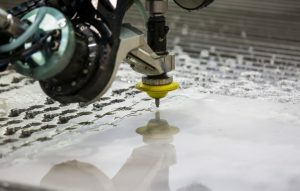 This may be stating the obvious, but a waterjet cutting machine is a serious industrial tool that requires an emphasis on safety while in use. Having the right knowledge about these machines is paramount to operating them safely and efficiently. 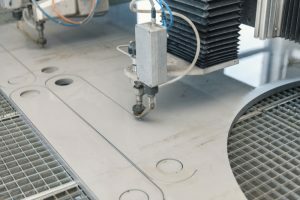 While the abrasive waterjet itself is the apparent danger, there are other parts of the machine that can harm or injure. While working with Hydro-Lazer, here are some dangers to avoid while working with a waterjet machine. A waterjet that carries abrasives such as garnet can do terrible damage and easily remove fingers if brought into contact. Fortunately, the stream is often easy to avoid. You should never attempt to steady any materials with your hands while the machine is in use, above or below the water; the jet is just as strong under the water as above. In fact, the central rule should be to never put your hands in or near the machine while it is running. While the stream doesn’t often kick up dust or debris, it’s always wise to wear protective eyewear while operating the machine. After repeated use, the supporting slats that lie above the water and support the material can become jagged and sharp from repeated cutting. This is the most common form of injury from waterjet machines – be cautious when replacing these slats. On large machines, never rely on the slats to support your weight while retrieving cut parts. Always put down a catwalk or board. Water is not as compressible as air. This means it only takes a bit of water leakage for all pressure to be lost. Many machines are built with the capacity to bleed off excess pressure, but you should always keep an eye on pressure readings while the machine is in operation. Be sure to keep an eye out for deterioration with any pressurized parts, as this can lead to dangerous pipe or tank bursts. Waterjet machines are valuable tools that manufacture parts for almost every major industry, and like every tool, they should be treated with care so our workers can come home safely. Contact Hydro-Lazer for the best cutting prices on the market today. Find, Like & Follow Us!